Hendrikus Group is a diverse company built on a unified core of principles and philosophy that combine knowledge of the natural sciences with intuitive understanding, embraced by a strong work ethic. The history and vision of the Hendrikus Group has its roots in the background of Hendrikus Schraven. From the earthen fields of Holland to modern geotechnical laboratories, Hendrikus has pioneered the science and practice of soil stewardship, design and construction techniques. Hendrikus’ vision and passion is this … to heal the earth, respect nature’s wisdom, and to do so with beauty and longevity. At the center of Hendrikus Group is a wealth of traditional european training, skill and craft, with a passion for hands-on excellence and an acute sense of ecological balance. We believe in a strong commitment to a practical, ecological bond between the artistry of man and nature’s art. 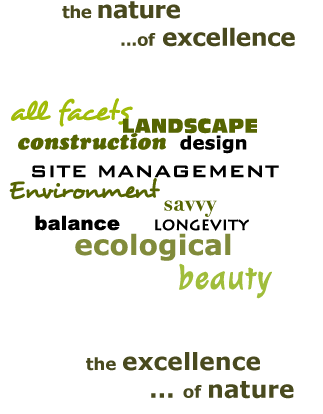 We believe in the wonder and vitality of the natural elements: wood, water, stone, earth, plants. We don’t design the commonplace, we don’t believe in kits. Like fingerprints, snowflakes and the stripes of a zebra, every project is unique. Our work expresses the nature of excellence, and the excellence of nature.